The lettering tour of the Magnificent Mile and The loop in Chicago was sold out within two hours, before I could even properly post an announcement of it. The tour itself was equally a success. We met at the Chicago Water Tower (William W. Boyington, 1869) and, after a brief look at the Fourth Presbyterian Church (Ralph Adams Cram, 1914), walked south along Michigan Avenue to The Loop, stopping to discuss the Allerton Hotel with its Tip Top Tap sign, the Tribune Tower (Howells & Hood, 1925), the Carbide and Carbon Building (Burnham Brothers, 1929) and other Chicago landmarks. Our final destination was the Chicago Cultural Center (Shepley, Rutan and Coolidge, 1897), originally the first public library in Chicago, marked by an astonishing art glass dome designed by Louis Comfort Tiffany. As the sun went down and the wind whipped up, we repaired to The Berghoff, a Chicago institution since 1898, where we drank excellent beer and ate hearty German food. 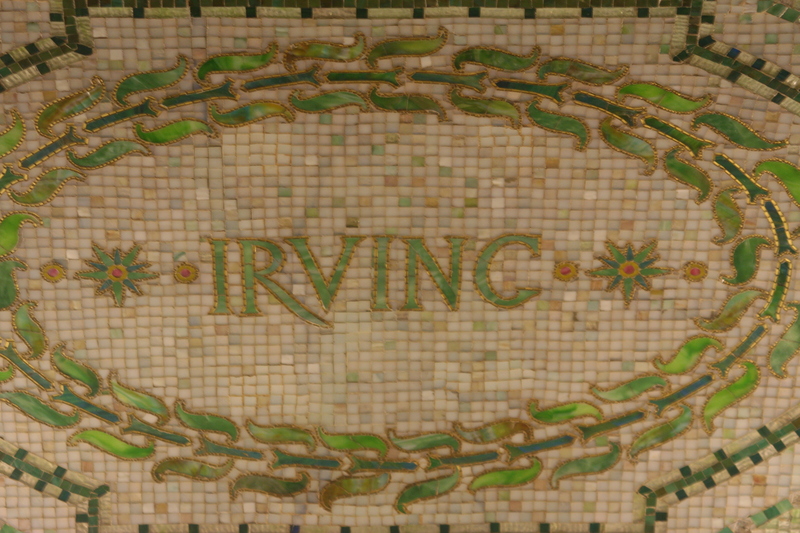 Chicago Cultural Center, mosaic lettering (1897).